I thought I'd share some pictures of Zack from the beginning of his trick-or-treating years up to today. 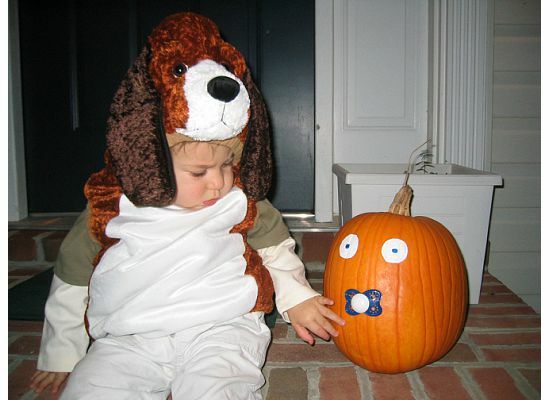 Zack has a love/hate relationship with Halloween. Most kids love to dress up and get as much candy as they can grab, but Zack has skipped several Halloweens, totally by his own choice. I was pretty excited this year that he wanted to participate, so today we've already had the costume on to make sure there are no wardrobe malfunctions during his march across the stage at school tomorrow. 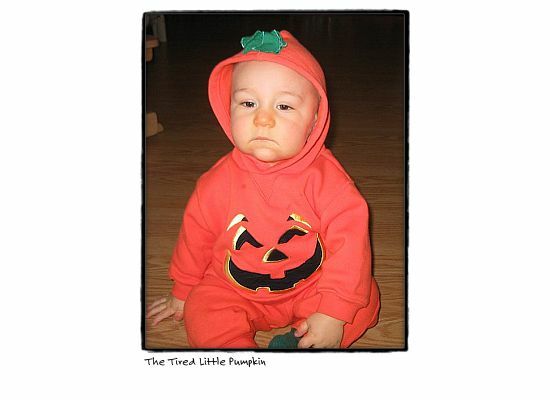 This one is Zack's first Halloween. He is completely overjoyed. Brimming with enthusiasm. Ready to take on that candy ... no, wait. Tired baby is tired. Sweet baby. This is probably my favorite series of photos. At age not-quite-two, I made a Zack Pumpkin, complete with one of his pacifiers. After struggling with a wriggly baby who did NOT want to be a puppy that year, we sat outside for a photo op. Here, he discovers his lost paci. This is when I dropped the camera and dashed for him so he wouldn't put a pumpkin-coated paci in his mouth. Doggy Baby was not amused. Bad mommy. Bad. 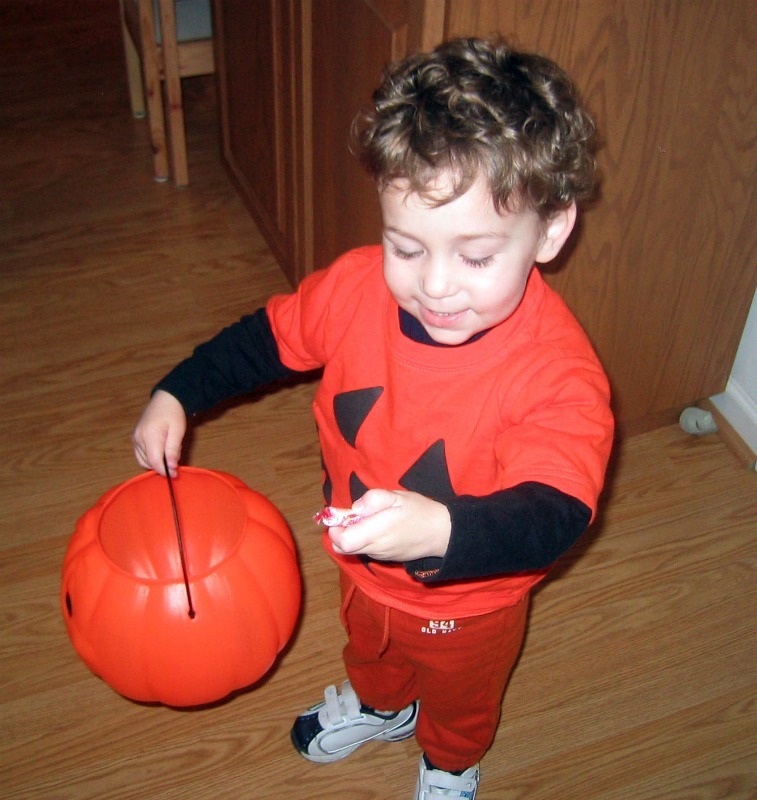 At three-years old, Zack was a little more interested, although he did NOT want a costume. Orange sweatpants and a pumpkin t-shirt was all he'd do. I love those old-school pumpkin buckets, don't you? And his first candy was from Mommy, a roll of Smarties (remember those?). It should be noted that Zack collects candy at Halloween and Easter, eats a piece that night, and then promptly forgets he got it. Good boy. Oh boy. 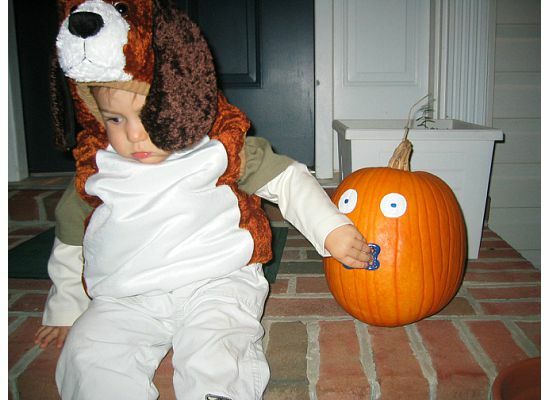 Age four, and he was ADAMANT he did NOT want to go trick-or-treating. Lucky for mommy she'd bought a Halloween shirt and Zack was still into orange, because an hour before the craziness of doorbell ringing and passing out fistfuls of candy, Zack decided he wanted to go after all. What in the HECK was I going to do? In an hour???? 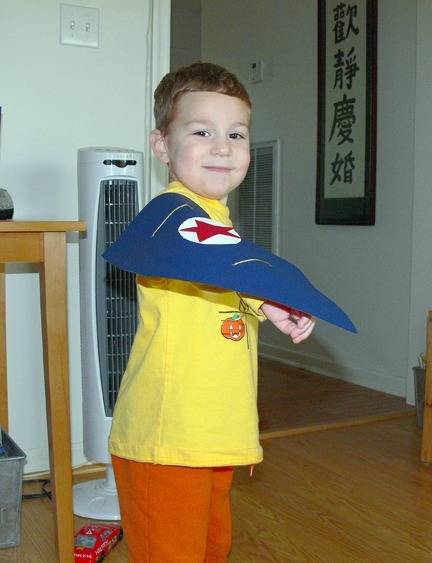 Luckily, I came up with making him an airplane, and cut out wings and stars for tie-on aerodynamics. And thank goodness Zack rolled with it! He really could have cared less that Halloween about candy -- he just wanted to run down the sidewalk zooooming and pretending to be an airplane with a huge smile on his face. Score one for Mommy and her closet full of craft miracles. Enter age five and my initiation into how expensive costumes are. 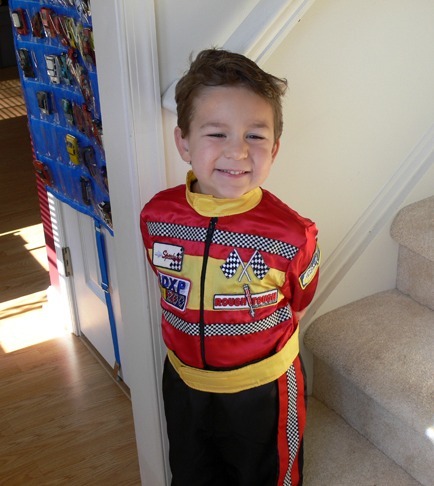 Zack loves everything car-related, can identify cars zooming down the road by tail light or body frame, and collects Hot Wheels with glee. 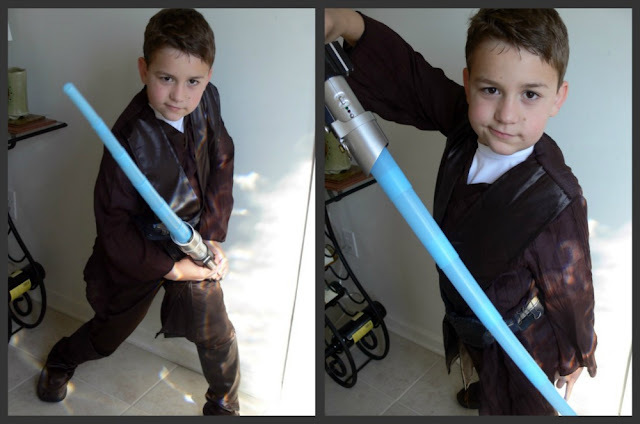 So after several years of his struggling with the no-costume-mommy issue, of course I spent what I needed to for him to have just the right get-up. 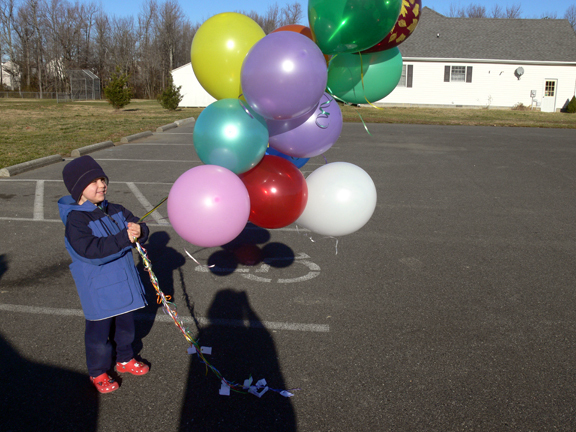 And he got to enjoy it a lot, too -- his preschool paraded down the sidewalk to a park and had a little festival. Proud mommy. Proud boy. Skip a few years, and we come to today. Zack surprised me a month ago by stating he wanted a costume, he was going to walk across the school stage with his class, and he was going to recite a Halloween poem with the group, too. I wanted to make sure that a) we had everything ready for a 6:45 am wake-up, and b) I could actually coax photos out of him. I have trouble getting action shots so tomorrow I'm liable to get NOTHING when he's on stage. 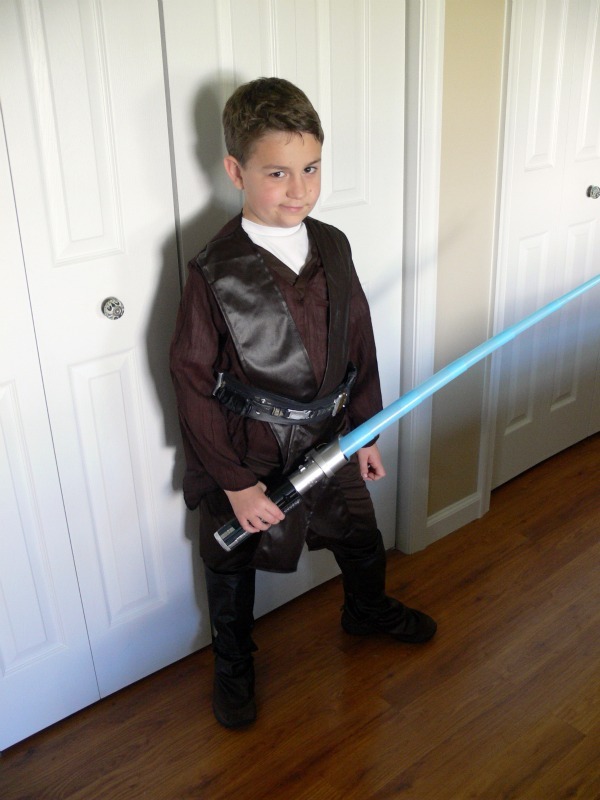 So I present Anakin Skywalker, age eight. 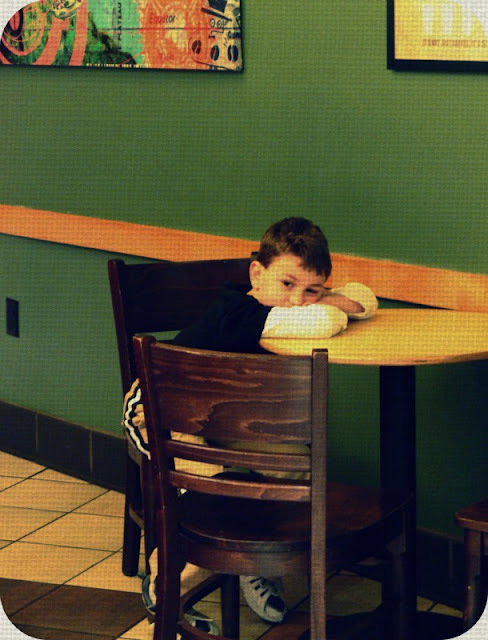 When I asked him to give me a sweet smile, he said patiently, but with a hint of exasperation, "Mom. Anakin doesn't DO smiles." This year I bought Zack a pumpkin that weighs about as much as he does. That is one heck of a pumpkin. We have stood on the front stoop, looking at it, mulling ideas over, trying to come up with a theme, ever since we brought it home. 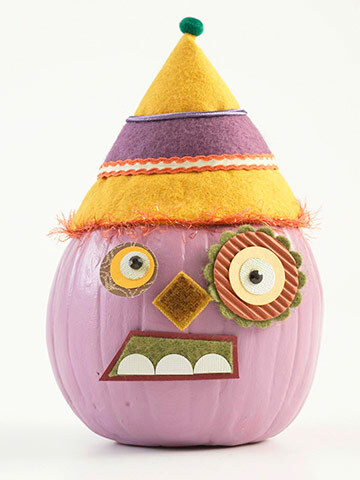 How to decorate something the size of six perfectly normal pumpkins? Carving was out of the question because our weather here in Maryland is so bipolar -- one day it's 70 and the next it's 40 and oh, don't forget about the rain. We learned the hard way last year not to carve a pumpkin unless you want to end up with a scary mess worthy of CSI. 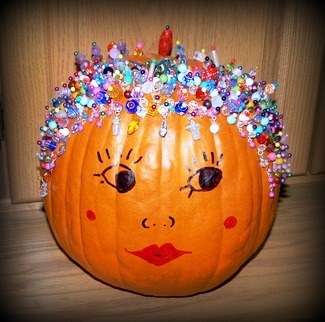 ...but that, my friend, is over 200 beads pinned into the pumpkin with quilting pins. A LOT of work, even with Zack doing a ton of it. He put that red bead right in the middle of the top of her head because he thought it made her look "extra fancy". Given the size of the mutant pumpkin we bought, we decided to let its sheer size speak for itself, and it stands unadorned; proud, a little lop-sided, and able to make a ton of pumpkin pies. 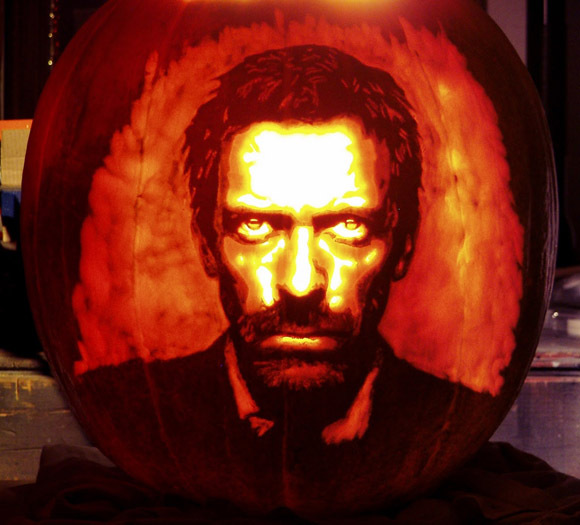 So this year I'll show you some photos of amazing pumpkins I've found on Pinterest. OMG. I can't help how much I love this guy. But that smolder is totally lost when he's King George IV in The Black Adder. He's the fancy one in the blond wig. Lumina pumpkins, black paint, and a steady hand. Raid your sewing basket! This is pretty easily done, especially if you have some steel wire you can cut long enough to press through the spools. Zack and I considered doing this -- but as I sit here it's pouring the rain down and I shudder to think what that would do. Melted mummy with shroud wrappings puddled around his neck. Which actually might be pretty cool. But. No. 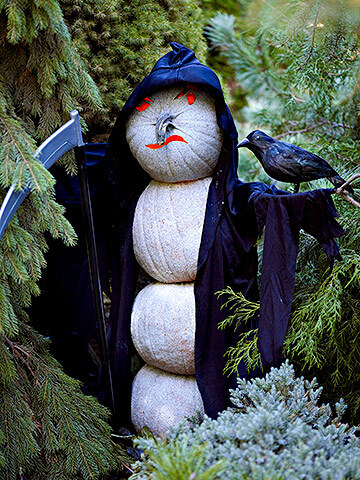 For the more adventurous, and those that can make a pumpkin snowman and not have it topple over. 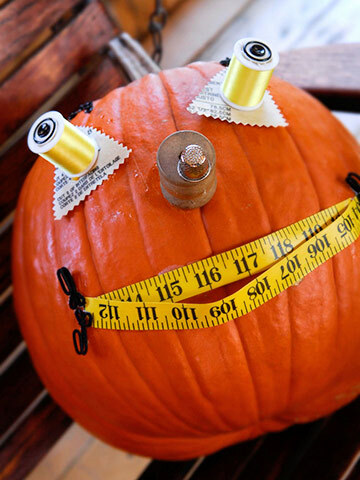 I could see doing this indoors with those fake Lumina pumpkins you can get at Michaels, adding a faux finish, and some strong dowel rods in between the pumpkins to chunk them all together. But instead, I have The Great Pumpkin. This one makes me ALL sorts of happy because it's purple. However it requires time that I just don't have. Maybe next year! 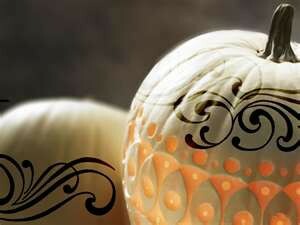 On a much, much smaller danged pumpkin. And a final trio of Lumina pumpkins (which you can probably tell I'm partial to). The one on the left is made with sequin trim and a spider you can find at Michaels. The middle one I just LOVE -- covered with lace. And last, cute owls with eyes made with (I'm pretty sure) unhulled sunflower seeds. 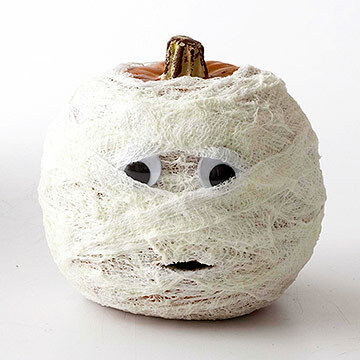 Now that I've written this post I feel like a total slacker with The Great Pumpkin. But the important thing is the kidlet loves it, and The Great Pumpkin will magically put a pop-up Halloween card in Zack's lunch box on Monday and will welcome him home Halloween night when he dumps out his candy from his Star Wars bucket and declares it a pretty awesome day. 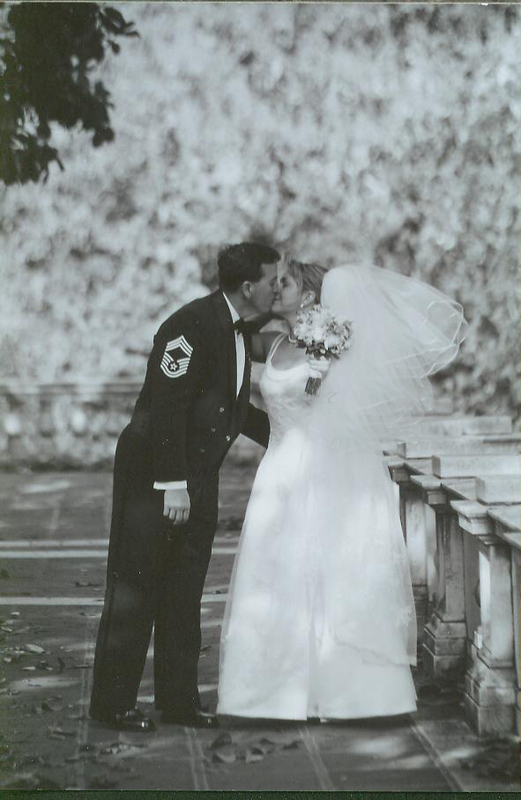 Today is Rick and my 11th wedding anniversary. I wrote a long story of the wedding here and here. I couldn't write it again much better than that. without whom this partnership wouldn't exist. and saying, "It'll be OK"
and putting up with the mood I'm in when I AM sick. when I don't feel that way. Thank you for 11 years. 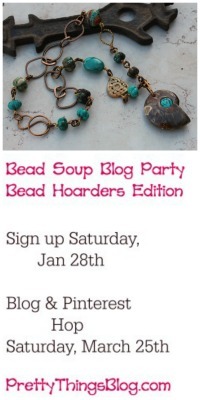 To learn more about the Cup of Bead Soup Project, click here. 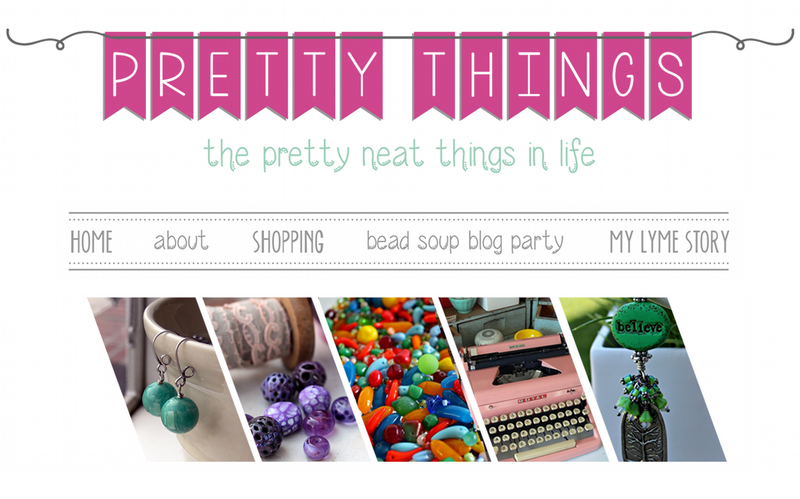 You can view past Cup of Bead Soup participants and the designs I created by clicking the button right below my blog banner. 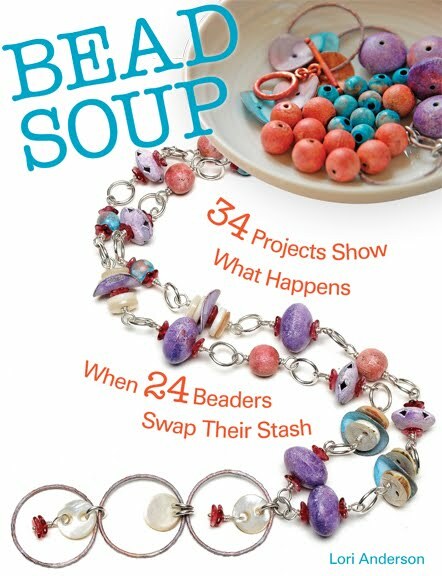 Also, I'll be creating a new Cup of Bead Soup program next year, where three of YOU will join me in creating a piece using a designers set of beads! So stay tuned for the full explanation in December. 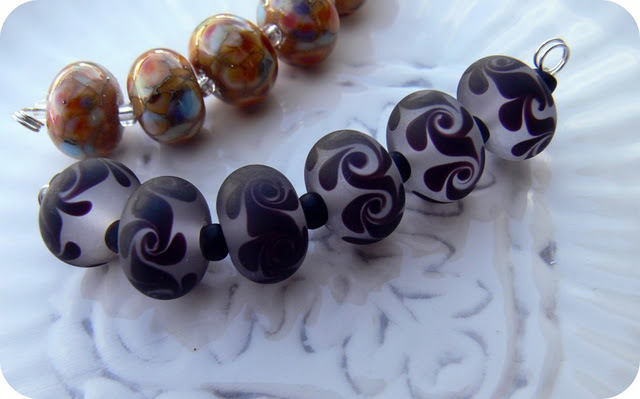 I really, really couldn't wait to work with Sue's set of etched black and clear lampwork beads. When I went to the Bead and Button show, I bought a lot of lucite flowers in all shapes, sizes, and colors. 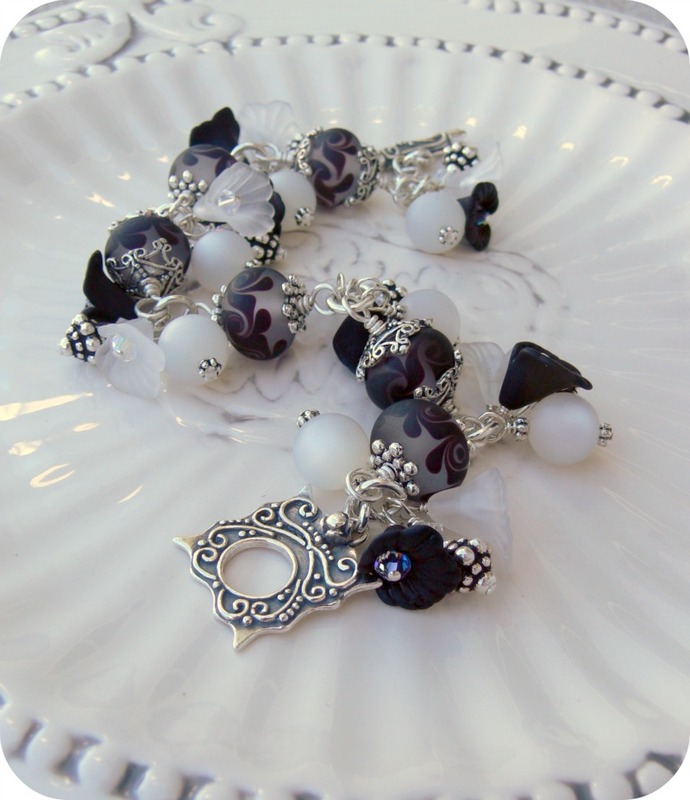 When I saw frosted white and black ones, I immediately got an idea, and put them together in a bag and stored them for when the right set of lampwork came my way. Well, these were the right set of lampwork. 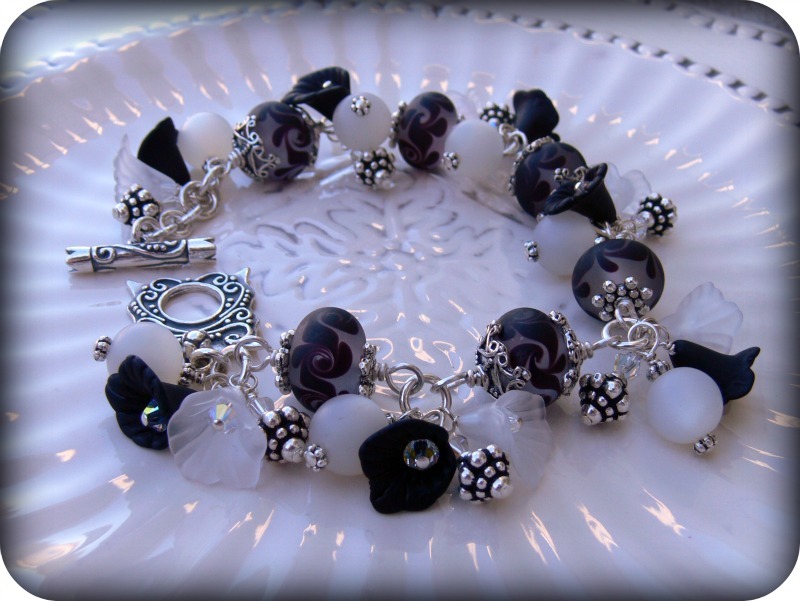 I added lucite flowers with Swarovski crystals nestled inside, and white frosted lucite beads. All are vintage, which I thought was apt as, to me, this looks like a Victorian piece. Even though as of today silver has dropped from $50/oz to about $35/oz, that's still a far cry from the $15/oz I'm used to working with, and the $4/oz I started with! So to help make things a bit more palatable for the customer, every other bead has gorgeous (but more expensive) bead caps, and the others have equally pretty but less expensive (relatively) large spacers. The small bead charms are Tierracast pewter (I sometimes mix sterling with pewter) and the toggle is a spectacular sterling silver (whose price has gone up hugely, and I cry). These bracelets take a long time to make, too. There's a fun story about this bracelet. I took it with me to my craft show this weekend. I am fortunate to have some amazing repeat customers, ladies who even take a day of vacation to come be the first in the door on Friday. One lovely lady got to my booth within five minutes of show opening and snagged this bracelet immediately. Then my second group of ladies came to the booth and wanted to know if I'd made something with "those pretty beads we saw on your blog". ... she'd get first dibs. So Sue, your bead were a hit! Book Review: "Atypical: Life with Asperger's in 20 1/3 Chapters"
and I have Book Fair duty this week? 1) As I mentioned, I have Book Fair duty all week, so I dressed nicely yesterday, including black pants. However, I have two long-haired cats, so when I got back home, I changed into pajama pants. Didn't want to get a forest of cat hair all over those pants, you know, and look disreputable. 3) I wandered the aisles of Target, trying to remember what I was supposed to buy. I knew it was important because my son told me "do NOT FORGET, mom!" this morning. I ended up with coffee, shampoo, and air freshener. I get home. 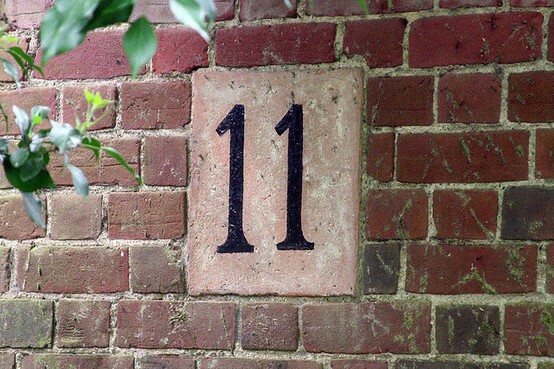 In the driveway, I remember. Crackers for his lunch. (cries some more as I turn the car around). 4) I have Book Fair duty today at 1pm. I will be given control of a cash register. This past weekend was one of my largest craft shows of the year. I work in the library of the house, which connects to the living room, so I get to enjoy my family the entire time. My heart melted each time Zack came over to quietly put his head on my shoulder and rub my back and check on what I was doing. 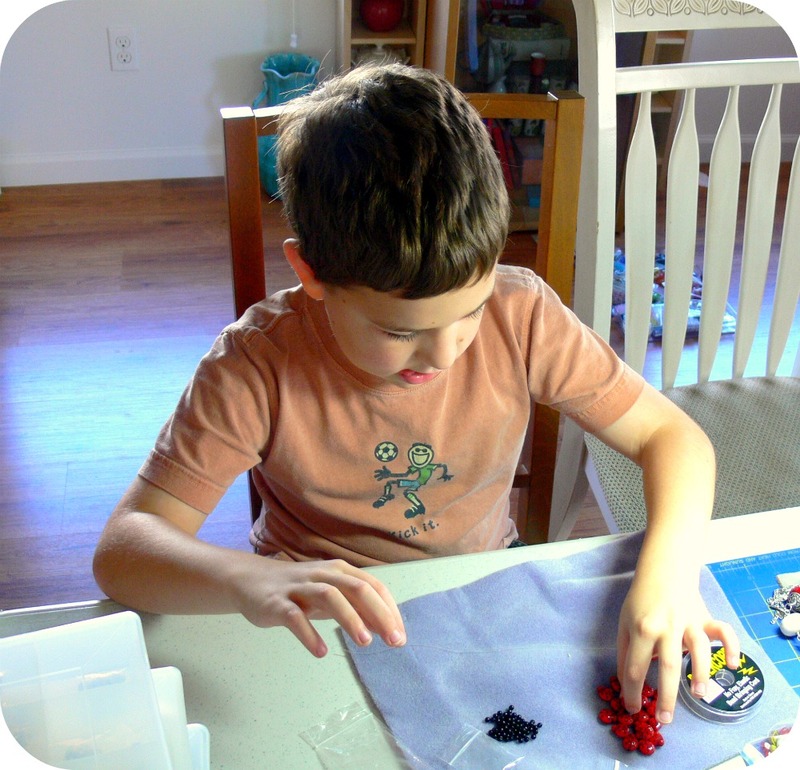 When he saw I was making some little girl bracelets, he asked if he could help. Why, of course he could, I said. The only thing I did for the kidlet was cut the elastic or wire and glue or crimp. 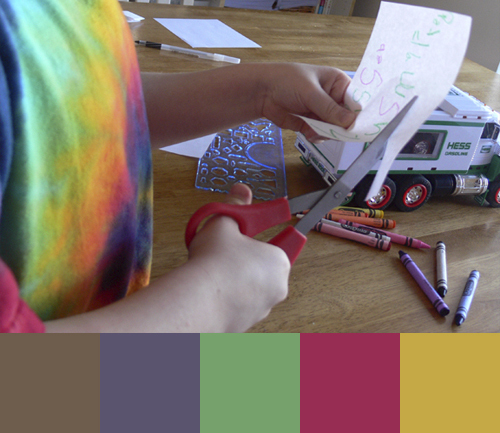 Zack chose all the colors and patterns, and he has a great eye for color. We quietly worked together for quite a while. 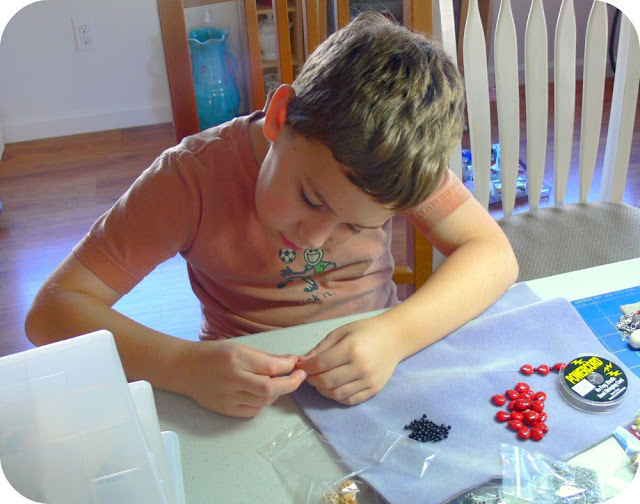 When he found my stash of ladybug beads, he got lost in them. He used every single one, even making an asymmetrical one when he didn't have enough ladybugs to finish one bracelet. I was proud of his innovation. The first sale of the day on Friday was his ladybug bracelet. All of his bracelets, in fact, sold over the weekend. I'm not a bit surprised. That look of quiet pride on his face when I handed him the money he earned was priceless. It wasn't a huge toothy grin, but a quiet, shy, towards-the-ground introspective grin. 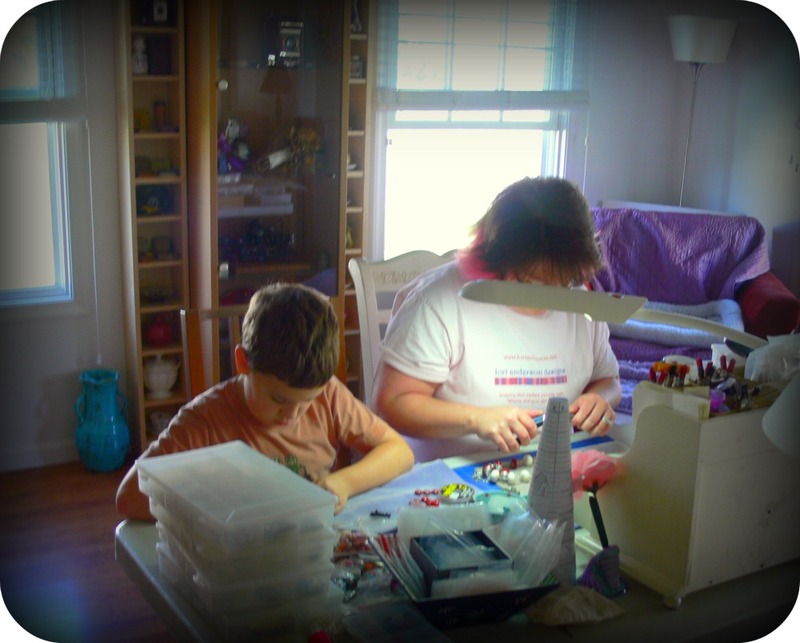 I know my boy well enough to know he was immensely proud, and I think I can count on him sitting beside me more often at the beading table. And now some jewelry tips and hints for you! Rena Klingenberg of Home Jewelry Business Success Tips just published some of my ideas on her blog -- if you're interested, click here! RICK, LORI, and ZACK check into the hotel and enter their room. LORI'S hypersensitive nose wrinkles so hard it practically turns inside out. Cue dramatic music -- dum dum DUUUUUUUM!!!!! LORI: What the... holy COW but this room reeks! Is that ... that's mildew. Ew, ew, ew. Rick, you've got to call the front desk and get them to DO something about it! LORI returns to the hotel from a stunningly busy day schlepping jewelry at a craft show. She opens the hotel room door. The mildew smell is indeed gone. LORI: (dramatic recoil) Who got hit upside the head twice with a skunk???? ZACK: (runs up to LORI and hugs her, sniffing deeply of her shirt. Happy smile.) Mom, you smell like cucumbers. LORI: (drops head in defeat) Well, at least there was pie at dinner. 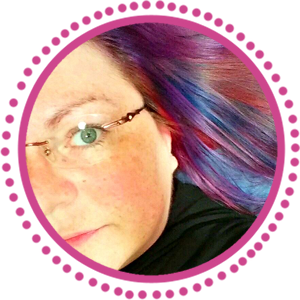 Brandi Hussey is a guru with color. She takes phenomenal photos, creates absolutely gorgeous jewelry, and has some incredibly sound advice for running online businesses. If you've never visited her blog, run, don't walk, to click her "Follow" button. Go do it, then come back here for the rest of the post. Oh hey, you're back! Cool! 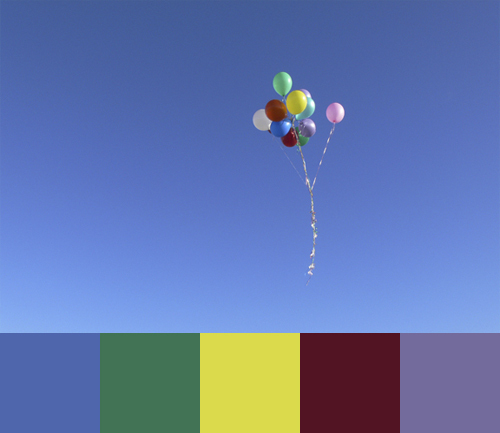 One of Brandi's claims to fame is her Color Palette Blog Walks. They're creative and clever and this is my first time participating. The theme for this walk is "What's the color of your joy?". Of course, the first word that comes to my mind when I think "joy" is "Zack". So I looked through tons of photos and ran across a series from January 1st, 2009, that many of you may not have seen. I take better photos NOW, but this set is particularly special to me. The idea -- to tie his wishes and dreams to balloon strings and let them go. 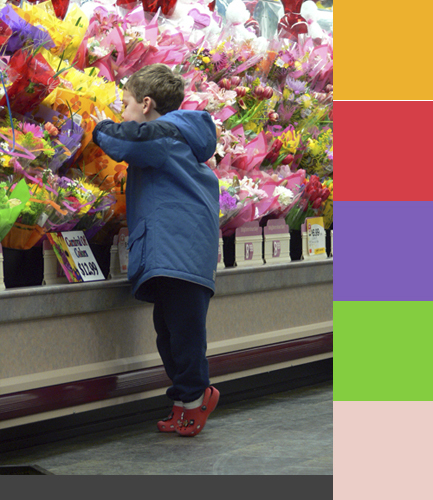 When we went to buy the balloons, Zack got distracted by all the flowers. And finally, he let his balloons off into the sky. What a great 2009 day! New Cup of Bead Soup with SueBeads! 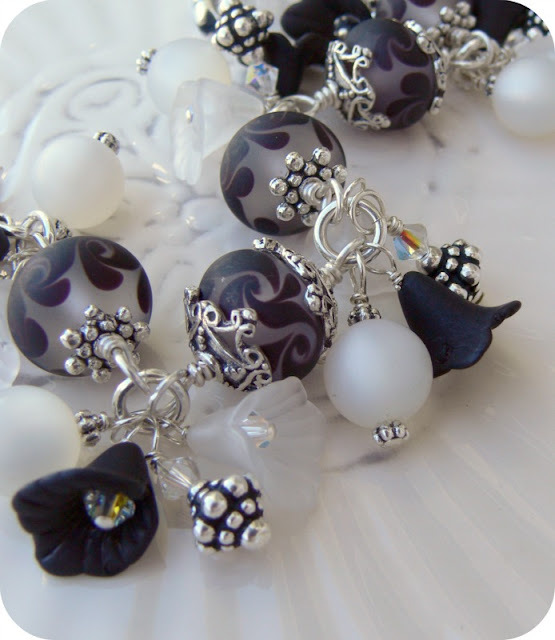 Win a Lampwork Focal at Art Bead Scene!